Wilder: Soon I Will Be The Highest Paid Athlete in The World! 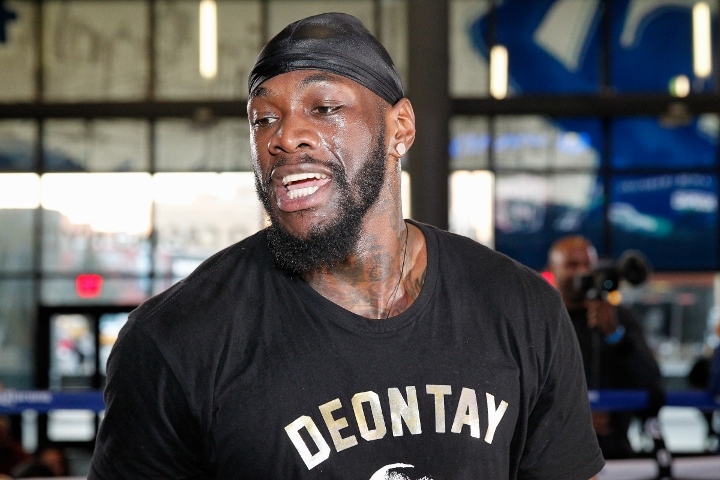 WBC heavyweight champion Deontay Wilder expects to eventually become the highest paid athlete in the world. Last fall, Wilder was offered a $15 million flat fee to face IBF, WBA, WBO, IBO world champion Anthony Joshua in a high profile unification. Only a few months later, he was offered well over $100 million for a multi-fight deal by DAZN, with $40 million for a Joshua fight. Wilder will return to the ring on May 18th, when he faces mandatory challenger Dominic Breazeale at Barclays Center in Brooklyn, New York City. In the immediate future, he would like to secure a rematch with Tyson Fury, and also the unification with Joshua. "It won't be difficult for me to make those fights with Fury and Joshua. I'm betting on myself. I move as I please. Those guys, they have to do as they are told. I make commands and demands. They take them. That's the difference between me and them. I'm like the wild card in all this. I move where I want. I can move freely. Soon I will be the highest paid athlete in the world. If no one believes it, just watch. You'll see. The DAZN deal wasn't right. You can't do a deal if you don't know the other parts of the deal. If information is withheld from you, how can you proceed further?," Wilder said to Daily Mail. 'I am not in the business of just trying to take some money because you see a number. That's not me. That's never been me. I look at the bigger picture. You sell me a number and I know there's going to be a bigger number than that. They saw a guy they thought they could throw some money at and that would be it but they found out the hard way. We came in serious and we were looking for serious answers and we didn't get them and for that reason we had to leave until a further time." Making those fights are easier said than done. Fury is aligned with ESPN, as part of his exclusive co-promotional deal with Top Rank. And Joshua is linked to DAZN, while Wilder is under the Premier Boxing Champions banner - who work with Showtime and Fox Sports. "Boxing's like the weather: it can change instantly. Although everybody is split up going different ways, the greatest thing about this situation with all three of us is that the doors are still open. Talks are still being talked. Negotiations are still in session. After the three of us fight these fights, it's time for real serious negotiations. Real serious talks. No playing around. I don't have time to play around. I have got a lot of things going on in my life, the correct way. What's owed to me will come to me," Wilder said. PBC must be pulling some real "Get Out" mind control [I]s[/I]hit on Wilder.